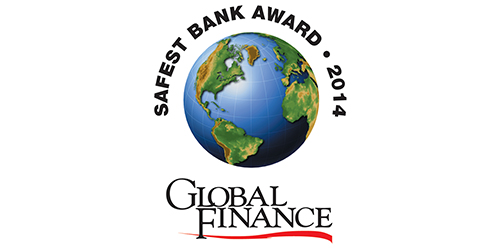 NEW YORK, Sept. 9, 2014 — Global Finance magazine has named the Safest Banks in Western Europe in an exclusive survey to be published in the Noveber 2014 issue. Banks were selected through an evaluation of long-term credit ratings—from Moody’s, Standard & Poor’s and Fitch—and total assets of the 500 largest banks worldwide. German banks performed well this year, with four making the list, including the top spot and three of the top four positions.